Mosquitos have a way of ruining picnics, barbecues, pool parties, and other warm weather festivities. There are many forms of mosquito control but one of the surest methods is to use a mosquito fogger before your event to make sure your guests don't go home itching and scratching. Mosquito foggers can cost several hundred dollars, but you can build you own from an old lawnmower. A mosquito fogger uses a source of heat to vaporize insecticide and a blower to send a cloud of it into the air where it kills any mosquitos it comes in contact with. With a bit of modification, any lawnmower can be made to do the same thing. The premise is simple: the heat generated by the engine is used to vaporize the insecticide, and the air pushed out of the mower's exhaust system forces the cloud into the yard. The mower is then pushed around the yard to distribute the chemicals where they are needed. To make it work, a tank must be mounted on the mower's handlebar to hold the insecticide which is fed into the muffler via a copper tube. The muffler must be modified slightly to accept the liquid and get it up to the temperature that will cause it to turn into a vapor. All the parts and supplies you need can be found at home improvement centers. Any type of gas-powered lawnmower may be used for this project. Unless you want to cut your grass at the same time you fog the yard, remove the mower blade before converting the mower into a fogger; it's safer this way if you're going to be using the fogger on terrain other than a lawn. Using heavy-duty zip ties, cinch a replacement plastic gas tank (one that comes with a poly tube, as with those used for lawnmowers and string trimmers) onto the handle bar of the mower on the side with the muffler. Attach it to the handlebars at the highest possible point where it will not interfere with the operation of the mower controls. The larger the tank, the more fogging you can do before having to refill it, but a two gallon tank is the largest practical size that doesn't weigh down the mower and make it difficult to maneuver. The tank will hold the insecticide and should be mounted so the area where the tube exits is facing down so the liquid can flow by gravity toward the muffler. If there are two tubes passing through the walls of the tank pull one out and plug the hole with a rubber stopper. Push the end of the other poly tube onto the barbed end of a 1/4-inch barbed to 1/4-inch NPT male valve fitting. Use a screwdriver to tighten a 1/4-inch hose clamp around the tube to hold it onto the fitting. Thread a 1/4-inch NPT female to 1/4-inch compression fitting onto the threaded end of the valve fitting. Use a tube flaring tool to flare the end of a 5-foot piece of 1/4-inch copper tubing and attach it to the compression fitting with pliers. Cinch the tubing to the mower handlebar with zip ties in a couple of places to secure it. Unscrew the muffler from the mower. Screw a 1/2-inch by 12-inch iron pipe into the hole where the muffler was. Screw a 1/2-inch iron pipe coupling onto the other end of the pipe and screw the muffler into the other end of the coupling. Drill a 1/4-inch hole into the pipe just before the point where it enters the coupling. Wrap the 1/4-inch copper tubing around the iron pipe, starting at the end nearest the mower. Insert the end of the copper tube into the hole in the iron pipe (cutting off the excess tubing, if necessary). Seal the joint between the copper tube and iron pipe with a cold weld adhesive compound. The mower-turned-fogger is very easy to use. 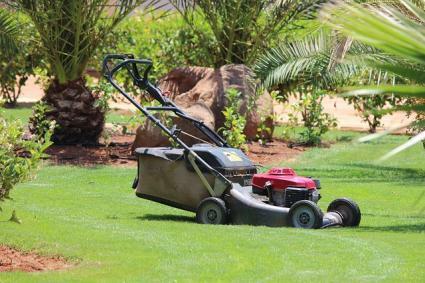 Close the valve below the gas tank on the handlebars, fill the tank with insecticide and then start the mower. Let the mower run for about 5 minutes to warm up. Then open the valve to let the insecticide through and start pushing the mower. A cloud of insecticide should come through the muffler as you go. Having the copper tube wrapped around the iron pipe heats up the liquid and vaporizes it as it passes through the muffler. Insecticide is a poison and should be handled with care. Wear a chemical respirator when operating the fogger and avoid spraying onto water bodies or in areas where people or animals are present. Also, the tubing, pipe, and muffler will become extremely hot during operation -- do not touch them. 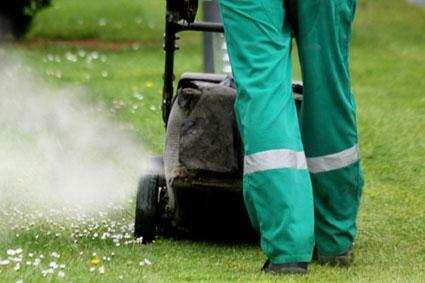 Straight insecticide must be mixed with kerosene or diesel or it will not vaporize when used in a lawnmower fogger. Permethrin is one of the most effective insecticides for mosquitoes. It commonly comes in 13.3 percent solution wherever pest control products are sold. Mix 4 to 6 ounces of it per gallon of diesel and add it to the fogger. Garlic is a natural alternative to synthetic insecticides for mosquitos. There are commercially available garlic sprays that are suitable for use in a fogger or you can make a garlic-based solution that will work in your fogger. This recipe makes 1 quart of insecticide. Put a 1/4-pound of garlic in a blender with one quart of water and blend until it is a smooth liquid consistency. Place a piece of cheesecloth over the top of a mason jar and slowly pour the mixture through it to strain out the bits of garlic. Pour the garlic juice into the fogger tank and use immediately. Making a DIY fogger isn't for everyone, but it is a cost-effective way to treat a large area with mosquito insecticide. Have fun with it, but be sure to stay safe if using a chemical insecticide.